Our obsession to dissect and understand leadership and elite fitness has gradually elevated both out of the reach to mere mortals. Fact is, you can become a leader and attain a level of elite fitness, it just depends on how hard you’re willing to work. Leading a group ride is a perfect example. As the point person, you must assemble a team of riders, map out your destination and route (cue sheet), set a meeting time, distribute the cue sheet, review it with everyone, answer questions, begin the ride, deal with faster and slower riders, mechanical issues, flats, and other unplanned challenges, and make sure everyone gets back in one piece. Then there’s the post-ride celebration, everything from muffins in the parking lot to microbrews in the pub. It’s a Leadership 101 lesson. For that glorious ride you are a leader. If you think you need to adopt someone else’s seven habits, go for it, otherwise tap in to what you’re already doing. Finding your inner elite athlete is as easy as setting and attaining goals. Reaching your goals may never be simple, but the blueprint to get you there ain’t brain surgery. Navigating the road to excellence takes risk, sweat, pain, and a plan. Are you willing to leave your comfort zone and take the next step? Making unpopular decisions that are best for the overall strategic direction of your organization. Pushing yourself physically in ways you never have. Collecting and analyzing data on your professional and athletic progress. Rearranging your time to selfishly spend some of it developing you. Consistently upgrading the quality of how you’re spending your time exercising, learning, and developing your skills. How often do we hold ourselves back? From negative self-talk to low self-esteem, fear of failure to time constraints, we have enough shackling us without imagining our goals already out of reach. 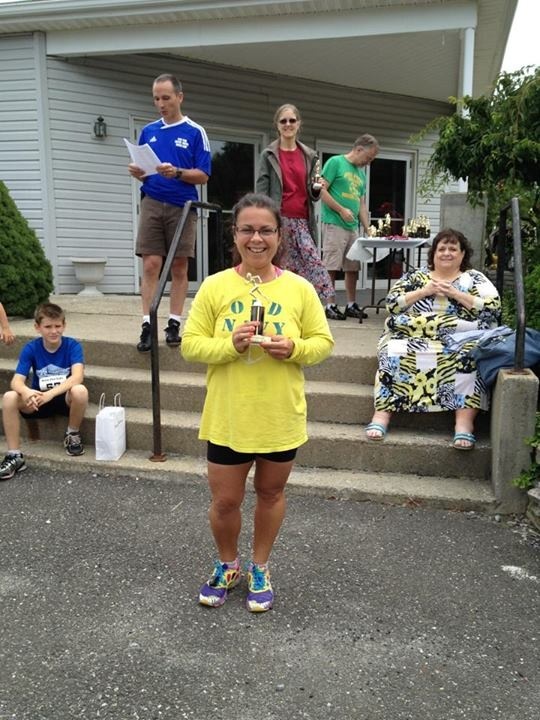 I have a friend, Liz (pictured above) who recently won first place in her age group at a 5K. Her athletic journey has been one of balancing family, friends, obligations, work, and exercising. Like all of us, she’s had successes and setbacks, and through it all she’s made time for her athletic passion and continued to push herself beyond her limits. I imagine it wasn’t so long ago the idea that she would be wearing a first place 5K medal seemed unthinkable to her. Today, that medal motivates my amazing friend to take her fitness to even higher levels because she is driven to improve. Drive can be misread as obsessiveness when in fact it’s healthy and necessary for progress. It can be developed over time and incorporated into everything you do with hard work and commitment. When you make the decision to be a leader and take your athletic life to the next level look inside yourself; you’ll find all the tools you need. This entry was posted in Athlete Training, athletic performance, Coaching, management style, Management Training, personal development, Uncategorized and tagged Business, coaching, cue sheets, Leadership, Management, management style, management training, Map, Medium (TV series), Physical fitness, self improvement, Self-esteem. Bookmark the permalink.